Notification of this event came in our inbox this morning thanks to #pivotdublin and we thought it would be worth checking out. This is the pragramme for the day which looks like it could be pretty cool. 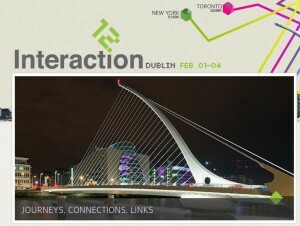 http://interaction12.ixda.org/programme/ Could our Virtual Shopfronts grab their attention? Next time You’re in Donnybrook check out how we transformed Donnybrook House. We were commissioned by Spain Courtney Doyle to look at what could be done with the ground floor glazing. Inititially the idea was to have one bespoke design across the entire ground floor but after a couple of discussions it was felt that 3 separate units would work best showing the potential of the building and to inspire new business. In the end our Virtual Deli, Coffee Shop and Newsagents were chosen for the 3 windows. HOW DO VIRTUAL SHOPFRONTS WORK? VS BOOST THE LOCAL ECONOMY! Our new video demonstrating exactly how our Virtual Shopfronts work! If this ever becomes a reality it would simply be amazing. How many years is it off in your opinion?